In the Vancouver Sun story from yesterday’s media event more information is forthcoming about fare evasion – and most of the points I made in yesterday’s blog post are conceded. So then all the expected savings have to come from collecting more fare revenue. One way you can tell when somebody’s lying is that they do not answer the question directly but point to some other true statement that makes them look better. So when you look at Translink’s performance recently on fare gates, you have to take into account how often the new smart card gets brought into the discussion. Smart cards could have been introduced at any time, once the new machine readable tickets were introduced. It is just matter of plug in modules for ticket vending machines (TVMs) on buses and stations, and they were designed that way. Similarly the payback calculations treat contributions from provincial and federal governments as cost reductions – which from a narrow, institutional perspective (commonly accepted standards of bookkeeping) might be acceptable but for public sector accounting is simply a fudge. The province provided $40 million and the federal government contributed $30 million from the Building Canada Fund. TransLink will fund the additional $100 million. So we ought to be looking at the payback on $170m not $100m. But we also need to discount the effect of the introduction of the long overdue new regulations that put fine collection revenue into Translink (not the province) but also give them powers to collect those fines. 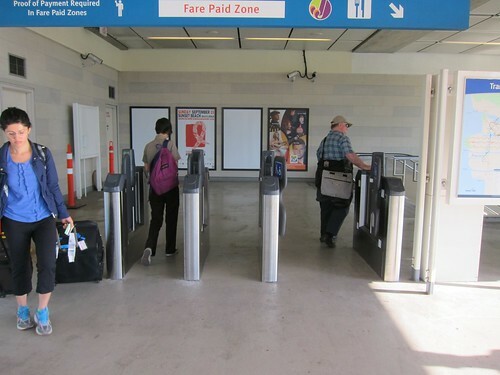 When it comes to people saying how much fare evasion has been reduced the period between now and the new gates going live will be the critical one to assess the effectiveness of these measures. Note that the possession of a driver’s licence is important to make these rules work. What happens when someone has no license is less clear. So far as I am aware, we are still in this country not required by law to carry an identification document with a valid mailing address. This seems to me to be a critical weakness of the collection of fine revenue. Transit police Chief Neil Dubord said some 60,000 violation tickets were issued last year, and similar numbers are expected for 2012. In 2011, TransLink lost $14.5 million in revenue, which is a combination of people not paying or paying only a partial fare and travelling into extra zones. Of that figure, $7.7 million in fare evasion occurred on rapid transit, with $6.2 million on buses. So far in 2012, TransLink has lost $6 million in revenue. These figures are very different from those that Frank Luba was quoting yesterday from earlier Translink reports. TransLink did audits in 2004 and 2008 that showed annual losses to fare evasion on the rapid transit system were between $5 million and $9 million. But another TransLink report from 2005 showed that yearly operations and installation costs for the system amortized over 20 years would be $30 million annually. Now $14.5m is a lot more than $5m but then fares have gone up a lot since 2004. Fare revenues last year were $356.6m (Translink 2011 Annual Report) so the evasion rate is still around 4%. Actually, the evasion rate is probably higher than that, simply because this only counts those who were caught, and accepts what they said about their journey as truthful. There will be some people travelling on tickets they were not entitled to (concessions and passes) and others making longer journeys but only buying a single zone. If there was much better data on travel that did not depend on ticket purchase data then there might be a better understanding on the extent of evasion, but we have for many years preferred to cut the cost of data collection to the point where I begin to doubt the validity of a lot of what is said about travel here. There is nothing said about the additional operating costs of moving to a gated rather than an open system. This extends far beyond policing costs, but also requires some insight into how the staffing needs to change to cope with the new system. I would not expect Translink to be forthcoming on these kinds of details (but see that 2005 data Luba quoted) and anyway the use of Compass already makes the situation confusing enough. Let us assume that they are lucky enough to cut evasion in half in the first year of operation and let us further credit all of that to the gates – forget the extra revenue from fines. So now Translink has $7m a year to pay down the $100m it is spending – and again we assume that policing and operating costs are a wash. Which is pretty much what Doug Kelsey was saying yesterday. Kelsey said TransLink is optimistic the system will “pay for itself,” with savings of $7.1 million every year, starting in 2014. 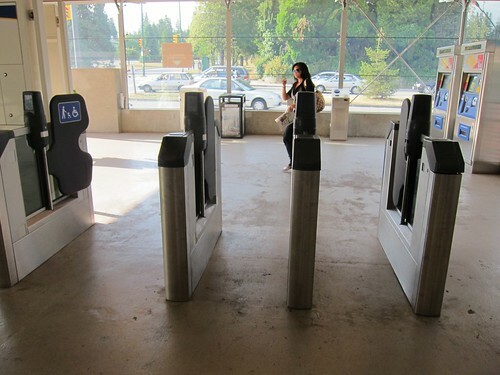 CORRECTION But the faregates only impact SkyTrain. So if they cut fare evasion there in half, there is only $3.8m in “new” revenue, since evasion on SkyTrain is said to cost $7.7m a year now. I do not see how this “pays for itself”. I also see no estimate of how much it is going to cost to rebuild Main Street and Metrotown stations to allow for the gates to be installed – all of which I think needs to be charged to the Faregates account since it would not be necessary (however desirable) if the project had not proceeded. I suspect too that the gaping hole on the revenue protection fence that will exist until these two stations are gate fitted, which will also significantly lower the expected savings. The decision to install faregates was made by Kevin Falcon when he was Minister of Transport. It made no sense then and it makes no better sense now but we are stuck with it. It is also too late now to turn back the clock and unmake it, and the BC Liberals are now so low in the polls that one more scandal can add nothing to the balance. Next year they are gone, and then – hopefully – some more sensible transit (and related) policy making will be seen. Not that that was a feature of previous NDP governments, but we must have hope, mustn’t we? 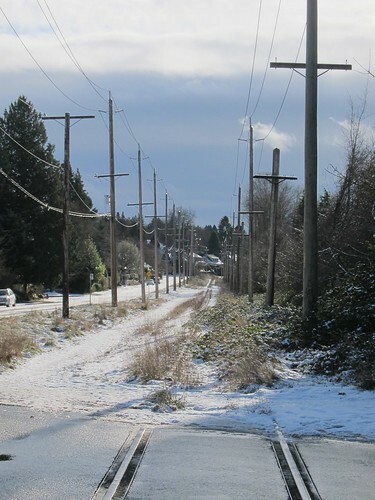 Trolley tracks and electric lines running down the middle of the street, however, are a promise: a line runs here. It may be ten minutes between trolleys, it may be half an hour, but something is going to come down that line and take you where you’re going. The very expense of creating the line tells you: the government has invested too much in this infrastructure for there to be no service. The rails are, literally, an ironclad guarantee. the woman Mr. Ford appointed to head the Toronto Transit Commission has added her voice …. Karen Stintz argues it makes more sense to put the LRT underground only along the most congested part of the route, in midtown, while building it on the surface in the spacious suburbs. The article ends with a quote from Jarrett Walker – of course. Translink is promising more transit – but as usual in ways that make me wince. It refers to large numbers of service hours for buses – without stating service hours per what unit of time. “An additional 40,000 service hours in April” sounds like a lot – until you ask yourself is that hours per year? Or hours this year from April to year end – and when is that anyway? Of course there is no mention of what that means as a percentage of what we currently have. The Base Plan (page 22) states that 4,928,000 hours per year will be delivered by the bus service each year from 2012 to 2021. So if the 40,000 is an annual figure that is an additional 0.8% – which is not much really, is it? “by year’s end, 180,000 new service hours will be in place” or 3.6%. To make that figure look respectable I chose to just look at bus service. Use the total annual service hours of 6,918,000 it’s only 2.6% which is better than no increase at all but hardly startling given the present levels of overcrowding. There’s a lot of blether about Faregates and how they are going to be more efficient and convenient for customers. Nothing about how the present system does not require most passengers with valid media to interact with anything now – and how easy it is to get in and out of stations and on to busy buses. And how systems with gates still manage to lose money to fare evaders, and how much the system is costing when there are many greater needs. Well, you can’t expect Translink to bite the hand that feeds it (even if so inadequately and inanely). I could not resist the story from New York (in Atlantic Cities) about one very inventive homeless person has managed to secure himself an income by utilizing the unused value of discarded transit passes. 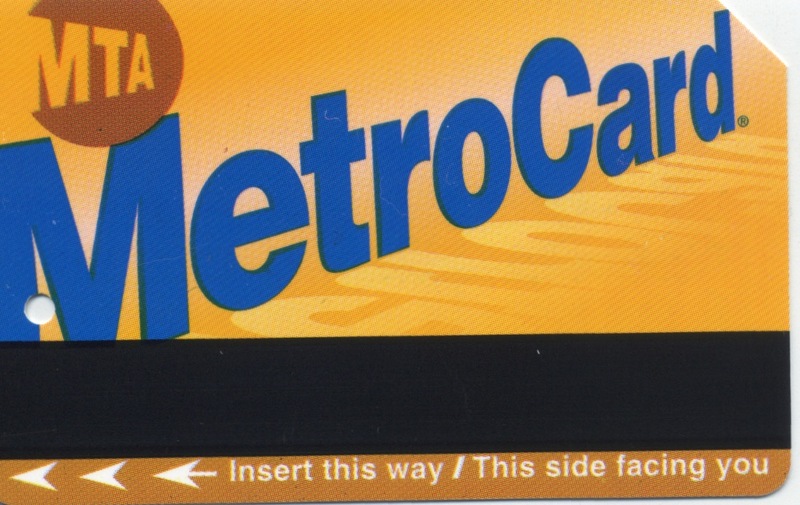 The Metrocard is sold in round dollar figures, not rides, and while people can top them up they are more likely to discard them with some value left on them and buy a new one. (Which reminds me, I have one somewhere I should dig out.) That adds $52 a year to MTA revenues – and someone has found a way to get his hands on a little of that. It’s an offence, of course.